​Hometown: Dover, New Jersey / Southfield, Michigan, U.S.
Unit: 1st Infantry Battalion, 9th Infantry Regiment, 2nd Brigade Combat Team, Camp Hovey, Korea. The Captain Sean Grimes Physician Assistant Student Society of the Jefferson College of Health Sciences is named after Capt. Sean Grimes, the first physician assistant to be killed in combat. His humvee hit an improvised explosive device on March 4, 2005, in Ar Ramadi, Iraq. Capt. Grimes epitomizes the military’s influence on the PA profession. He is a credit to the PA profession, his country, and the United States Army. Captain Sean Grimes, 31, of Bloomfield Hills, Mich., was killed in action in Iraq. Born to Mary Grimes of Dover and Donald P. Grimes of Southfield, Mich., brother of Don of Allso Viejo, Calif., and Mary Grimes of Pittsburgh, Pa, also survived by his nephew, Scott Grimes of Allso Viejo, Calif., and many aunts, uncles, and cousins. A Funeral Mass was held at St. Cecilia's R.C. Church, Rockaway. Sean died when an improvised explosive device detonated near his patrol. He was assigned to the 1st Infantry Battalion, 9th Infantry Regiment, 2nd Brigade Combat Team, Fort Carson, Colo.
Sean P. Grimes was born on 29 May 1973 in Pontiac, Michigan to Donald and Mary Grimes. After high school, he served in the Army Reserve as a medic in an aviation unit. 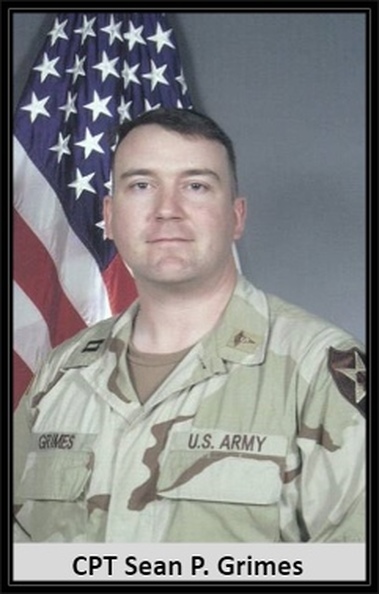 He graduated from Michigan State University in 1997 with a degree in Nursing and was commissioned as a Second Lieutenant in the Army Nurse Corps.Captain Grimes’ first assignment was to Germany where he served for over three years as a Critical Care Nurse. While in Germany he deployed for six months to Kosovo where he served as an assistant head nurse. After his time in Europe he decided to broaden his skills and attended the Military Physician Assistant (PA) program and then reported to Korea in 2003. CPT Grimes served in Korea with 6-37 Field Artillery as their PA and also served for a time as the DIVARTY Surgeon. When the announcement was made that 1-9 would deploy, he volunteered to join the Manchus and serve as the battalion physician assistant for the deployment.CPT Grimes was a brilliant practitioner of medicine. In addition to his broad base of skills and experience in the medical field, his personality made him even more effective. He had a great sense of humor and was dedicated to his friends and family. He was a man of the world who loved foreign travel and constantly sought out new experiences. He was always upbeat and positive and one could never leave a conversation with him without feeling happier.Amongst CPT Grimes’ awards and decorations are the Bronze Star (Posthumous), the Purple Heart (Posthumous), the Army Commendation Medal, The Kosovo Campaign Medal, the Combat Medic Badge, Aviator Crewman’s wings, the Basic Parachutist Badge and the Air Assault Badge. He is survived by his parents, his brother Donald and his sister Mary. A scholarship fund has been established in his honor by his family in conjunction with the AAPA and SAPA. The Fund information and Application links are included on this page.